Another gem of a reissue from the David Bowie vault, Loving the Alien, comprises Bowie's three major hit albums from the '80s: a decade which, for Bowie, was perhaps his most varying, commercially successful, critically inconsistent, and adventurous era. Bowie, who was always considered a daring musician, produced some of his most cash and radio-ready tracks during this era (1983-88), as well as starring in films and working with international superstars. Where the '70s saw a Bowie album every year of the decade, '80s-era Bowie was very much a tinkerer, a studio frontiersman—and that sense of experimentation often produced negative reviews. The three major cornerstones of this reissue are remastered versions of 1983's Let's Dance, an album that blended dance music and blues like no one had ever done before; 1984's Tonight, which saw Bowie "rush" to capitalize on a new audience—a notion he would later admit regret; and 1987's Never Let Me Down, which was ill-received by critics, leading to the creation of his hard rock band, Tin Machine. The box set includes a new 2018 version of Never Let Me Down, with newly recorded instrumentation to back up Bowie's original vocals. Two live albums also make an appearance, Serious Moonlight (an unreleased live album recorded in 1983) and Glass Spider (Live Montreal '87), and Bowie's non-album tracks (including several songs Bowie co-performed with Tina Turner), and soundtrack work from 1986, most notably the film Labyrinth, also appear. Despite the content's initial critiques at the time of individual release, Loving the Alien certainly fits nicely into Bowie's legacy of recordings. 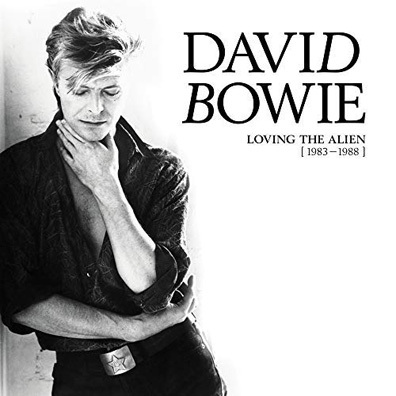 Titular track, "Loving the Alien," which was panned at the time of its release now sounds remarkably precursory to 2016's Blackstar: the theatrics of the vocals, the almost frightening science fiction elements to the song's narrative—this and other Tonight tracks seem to work better now than they did in 1984. Like Bowie's work on Tonight and the other often overlooked albums of the late '80s, it took several decades to realize just how integral these records were to his overall body of work. There wouldn't be a Blackstar without Heathen or Reality, just as there wouldn't be a Let's Dance without 1979's less positively received Berlin Trilogy closer, Lodger. Everything in Bowie's illustrious career was built on what came before it, and Bowie didn't seem to care too much if an album never quite hit the mark. The (really only) benefit of living in a post-Bowie era is seeing his entire discography as a closed anthology.